Washington D.C. November 22, 2005 - Twenty years ago this week the leaders of the United States and the Soviet Union concluded their Geneva Summit, which became the first step on the road to transforming the entire system of international relations. Unlike the summits of the 1970s, it did not produce any major treaties, and was not seen as a breakthrough at the time, but as President Ronald Reagan himself stated at its conclusion, "The real report card will not come in for months or even years." The movement toward the summit became possible as a result of change in the leadership in the Soviet Union. On March 11, 1985, the Politburo of the USSR Communist Party Central Committee elected Mikhail Sergeevich Gorbachev as its new General Secretary. This event symbolized the beginning of the internal transformation of the Soviet Union. Today, twenty years after those seminal events, the National Security Archive is posting a series of newly declassified Soviet and U.S. documents which allow one to appreciate the depth and the speed of change occurring both inside the Soviet Union and in U.S.-Soviet relations in the pivotal year of 1985. Most documents below are being published for the first time. Upon coming to power, the new Soviet leader initiated a series of reforms, beginning with acceleration of the economy, the anti-alcohol campaign, and the new policy of glasnost (openness), which became known later as perestroika. Although unnoticed by most Western observers, early significant changes were taking place in the internal political discourse of the Communist party with less ceremony and more open discussion at the sessions of the Politburo and the Central Committee Plenums. In the hierarchical Soviet system, the power of appointment allowed the top leader to build an effective political coalition to implement his new ideas. Gorbachev used his position as General Secretary to bring in officials who shared his worldview as key advisers and promoted them to the Central Committee and the Politburo. In 1985, two of the most important figures Gorbachev brought into the inner circle were Alexander Yakovlev and Eduard Shevardnadze. Already by the end of the year, in a memorandum to Gorbachev, Yakovlev proposed democratization of the party, genuine multi-candidate elections to the Supreme Soviet, and even the need to split the party into two parts to introduce competition into the political system. In the sphere of U.S.-Soviet relations, the first year of perestroika was one of building trust and of intense learning for both Mikhail Gorbachev and Ronald Reagan. Although public rhetoric did not change to any significant degree, the unprecedented exchange of letters between the two leaders gave them an opportunity to engage in a serious dialog about the issues each saw as the most important ones, and prepared the ground for their face-to-face meeting in Geneva. One of the most important issues that came up repeatedly in the letters was the need to prevent nuclear war by way of reducing the level of armaments to reasonable sufficiency, where each side would enjoy equal security without striving for superiority. In this still tentative journey to find the right approach to each other, both leaders relied on the advice and good offices of another world leader for whom they had great respect and trust-Margaret Thatcher. (See memoranda of Margaret Thatcher's Conversations with Mikhail Gorbachev and Ronald Reagan as well as their correspondence at the Archive of the Margaret Thatcher Foundation). Both sides had relatively low expectations going into the Geneva Summit. No draft of a final statement was prepared, partly due to the very different agendas each leader had. Both, however, believed that they would be able to persuade the other during the course of their personal encounter. Gorbachev was hoping to convince Reagan to reaffirm Washington's commitment to the SALT II treaty, which had never been ratified, and to return to the traditional interpretation of the ABM treaty, which in essence would have meant abandoning SDI. He succeeded in neither of those efforts, but he did obtain a joint statement in which both sides pledged that they would not seek strategic superiority, and most importantly, stated that "nuclear war cannot be won and must never be fought." Upon returning home, the Soviet leader repeatedly emphasized this anti-war aspect of the joint statement and played down the sharp disagreements on SDI and space weapons which transpired during the discussions. Reagan, upon returning to the United States, presented the summit as his victory, in which he did not give in to Gorbachev's pressure to abandon SDI, but in turn was able to pressure the Soviet leader on human rights. In reality, in addition to agreeing in principle to the idea of a 50 percent reduction in strategic arms and an "interim" agreement on INF, the main significance of the Geneva Summit was that it served as a fundamental learning experience for both sides. Gorbachev realized that strategic defense was a matter of Reagan's personal conviction and that most likely it was rooted not in the needs of the military-industrial complex but in the President's deepest abhorrence of nuclear war. Reagan, on the other hand, had a chance to appreciate the genuine, repeatedly expressed concern of the Soviet leader about the possibility of putting nuclear weapons in space, which was the essence of Gorbachev's fears over SDI. Reagan also could sense Gorbachev's sincere eagerness to proceed with very deep arms reductions on the basis of equal security, not superiority. Reagan also sensed in Gorbachev a willingness to make concessions in order to move forward on arms control. Both leaders came out of the summit with a new appreciation of each other as a partner. They succeeded in building trust and opening a dialog, which in very short order made possible such breakthroughs as Gorbachev's Program on the Elimination of Nuclear Weapons by the Year 2000 (January 15, 1986) and the INF and the START Treaties. Mikhail Gorbachev was elected General Secretary at a special Politburo session convened less than 24 hours after Konstantin Chernenko's death. According to most Russian sources, the election was pre-decided the day before when he was named the head of the funeral commission. At the Politburo itself, Gorbachev's name was proposed by Foreign Minister Andrei Gromyko, who was at the moment the most senior Politburo member and one the core members of the Brezhnev inner circle. Gromyko's speech praised Gorbachev's human and of business qualities, and his experience of work in the party apparatus, in terms that were less formal than similar speeches at the elections of previous general secretaries. There were no dissenting voices at the session, partly because of Gromyko's firm endorsement, and partly because three potential opponents--First Secretary of Kazakhstan Dinmukhamed Kunaev, First Secretary of Ukraine Vladimir Shcherbitsky, and Chairman of the Council of Ministers of Russia Vitaly Vorotnikov--were abroad and could not make it to Moscow on such a short notice. In his first letter to the new leader of the Soviet Union, President Reagan states his hope for the improvement of bilateral relations and extends an invitation for Mikhail Gorbachev to visit him in Washington. He also expresses his hope that the arms control negotiations "provide us with a genuine chance to make progress toward our common ultimate goal of eliminating nuclear weapons." In his first conversation with the leader of Afghanistan, who was brought in by the Soviet troops in December of 1979, Gorbachev underscored two main points: first that "the Soviet troops cannot stay in Afghanistan forever," and second, that the Afghan revolution was presently in its "national-democratic" stage, whereas its socialist stage was only "a course of the future." He also encouraged the Afghan leader to expand the base of the regime to unite all the "progressive forces." In no uncertain terms, Karmal was told that the Soviet troops would be leaving soon and that his government would have to rely on its own forces. Gorbachev discusses the results of his meetings with foreign leaders during Konstantin Chernenko's funeral at the conference of the Central Committee Secretaries. He notes the speeches made by the socialist allies, especially Gustav Husak, Jaruzelski's suggestion to meet more often and informally, and Ceausescu's opposition to the renewal of the Warsaw Pact for another 20 years. Among his meetings with Western leaders, Gorbachev speaks very highly about his meeting with Margaret Thatcher, which had "a slightly different character" than his meetings with other Westerners. A two-hour meeting with Vice President George Bush and Secretary of State George Shultz left only a "mediocre" impression, but an invitation to visit the United States was noted. Describing his meeting with President of Pakistan Zia Ul Hak, Gorbachev for the first time used a phrase usually dated to the XXVI party congress: he called the war in Afghanistan "a bleeding wound." In his first letter to the U.S. President, Gorbachev emphasizes the need to improve relations between the two countries on the basis of peaceful competition and respect for each other's economic and social choice. He notes the responsibility of the two superpowers and their common interest "not to let things come to the outbreak of nuclear war, which would inevitably have catastrophic consequences for both sides." Underscoring the importance of building trust, the Soviet leader accepts Reagan's invitation in the March 11 letter to visit at the highest level and proposes that such visit should "not necessarily be concluded by signing some major documents." Rather, "it should be a meeting to search for mutual understanding." In response to Gorbachev's March 24 letter, Reagan stresses the common goal of elimination of nuclear weapons, the need to improve relations, and specifically mentions humanitarian and regional issues. He calls Gorbachev's attention to the recent killing of Major Nicholson in East Germany and describes that as "an example of a Soviet military action which threatens to undo our best efforts to fashion a sustainable, more constructive relationship in the long term." The Politburo session discussed the issue of "drunkenness and alcoholism"-and adopted one of the most controversial resolutions of all the perestroika period, which when implemented became the source of great public outcry and resulted in significant losses of productivity in wine-producing areas in Southern Russia, Moldavia and Georgia. Vitaly Solomentsev made the official presentation to the Politburo producing shocking statistics of the level of alcoholism in the Soviet Union. In an unprecedented fashion, even though the main presentation was strongly supported by the General Secretary, there was opposition among the Politburo members. Notably, Deputy Finance Minister Dementsev spoke about how a radical cut in the level of production of alcoholic drinks could affect the Soviet economy, and prophetically stated that "a significant decrease in the production of vodka and alcohol products might lead to the growth of moonshine production, as well as stealing of technological alcohol, and would also cause the additional sugar consumption." The discussion also reveals the sad state of the Soviet economy, incapable of providing goods for the money held by the population if vodka production were to be cut. In this letter, Reagan gives a detailed response to Gorbachev's letter of March 24. After drawing Gorbachev's attention to the situation with the use of lethal force by Soviet forces in East Germany, Reagan also touches on most difficult points in US.-Soviet relations, such as the war in Afghanistan, and issues surrounding strategic defenses. The President mentions that he was struck by Gorbachev's characterization of the Strategic Defense Initiative as having "an offensive purpose for an attack on the Soviet Union." The rest of the letter provides a detailed explanation of Reagan's view of SDI as providing the means of moving to the total abolition of nuclear weapons. In his response to Reagan's letter of April 30, the Soviet leader raises the issue of equality and reciprocity in U.S.-Soviet relations, noting that it is the Soviet Union that is "surrounded by American military bases stuffed also by nuclear weapons, rather than U.S.-by Soviet bases." This letter shows Gorbachev's deep apprehensions about Reagan's position on the strategic defenses. The Soviet leader believes that a development of ABM systems would lead to a radical destabilization of the situation and the militarization of space. It is clear from this letter, that at the heart of the Soviet rejection of the SDI is the image of "attack space weapons capable of performing purely offensive missions." This Politburo session became the first one of many where Gorbachev used his power of appointment to quickly and decisively bring his supporters into the inner circle of the Politburo, and to retire those apparatchiks, who, in Gorbachev's view could not be counted on to implement the new reforms. At this historic session, it was decided to promote Andrei Gromyko to the position of Chairman of the Presidium of the USSR Supreme Soviet, replacing him with the relatively unknown Eduard Shevardnadze, send Grigory Romanov into retirement, and promote Boris Yeltsin to head the Construction Department of the CC CPSU in addition to many other personnel changes in the highest echelon of power. Gorbachev dealt with each promotion or replacement in a quick and business-like manner, which did not leave any space for opposing voices. As an example of still slow and uneven progress of perestroika in its first year, the Politburo discusses a request from the exiled Academician Andrei Sakharov to allow his wife to travel abroad for medical treatment. The highly ideological discussion was dominated by KGB Chairman Viktor Chebrikov, who describes Yelena Bonner's "100% influence" over Sakharov. Mikhail Zimyanin called her "a beast in a skirt, an imperialist plant." However, the issue of whether to allow Bonner to go abroad is discussed in the framework of its potential impact on the Soviet image in the West, and especially in the light of the forthcoming Gorbachev meeting with Presidents Reagan and Mitterand. This intelligence analysis presents a dire picture of the Soviet economic situation that the new Soviet leader had to face after his election, and calls his new economic agenda "the most agressive since the Khrushchev era." Gorbachev is expected to show willingness to reduce the Soviet resource commitment to defense, legalize private-sector activity in the sphere of cunsumer services, and try to break the monopoly of foreign trade apparatus. However, the assessment is very cautious, suggesting that if Gorbachev continues to rely on "marginal tinkering," it would mean that he "like Brezhnev before him, has succumbed to a politically expedient but economically ineffective approach." The analysis correctly notes that Gorbachev's expectations going to Geneva were very low. According to the CIA, the Soviet leader would be primarily seeking to explore Reagan's personal commitment to improving relations and arms control. Gorbachev was also expected to reaffirm commitment to SALT II and persuade Reagan to agree to a mutual reaffirmation of the ABM treaty. The analysis predicted a possibility of Gorbachev taking an aggressive posture to emphasize Soviet equality with the U.S. administration on such issues as the Soviet role in the regional disputes and human rights. In their first private meeting Reagan and Gorbachev both spoke about the mistrust and suspicions of the past and of the need to begin a new stage in U.S.-Soviet relations. Gorbachev described his view of the international situation to Reagan, stressing the need to end the arms race. Reagan expressed his concern with Soviet activity in the third world helping the socialist revolutions in the developing countries. Gorbachev did not challenge the President's assertion actively but replied jokingly that he did not wake up "every day" thinking about "which country he would like to arrange a revolution in." 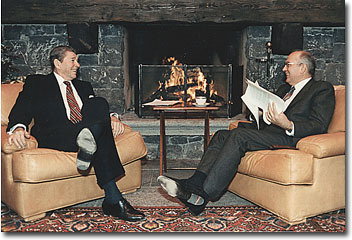 At this session, Gorbachev gives a quite assertive and ideological performance, explaining his views of how the U.S. military-industrial complex is profiting from the arms race and indicating that the Soviet side is aware of the advice that conservative think tanks, like the Heritage Foundation, give the President-that "they had been saying that the United States should use the arms race to frustrate Gorbachev's plans, to weaken the Soviet Union." He also challenges Reagan on what the Soviet side viewed as a unilateral definition of U.S. national interests. Reagan's response raises the need to build trust and rejects Gorbachev's insistence that the interests of the military-industrial complex define the policy of the United States. In response to Reagan's discussion of the SDI, and the need for strategic defense if a madman got his hands on nuclear weapons, Gorbachev lays out a Soviet response to a U.S. effort to actually build an SDI system : there will be no reduction of strategic weapons, and the Soviet Union would respond. "This response will not be a mirror image of your program, but a simpler, more effective system." In his response, Reagan talks about regional issues, particularly Vietnam, Cambodia and Nicaragua. On SDI, the U.S. President makes a promise that "SDI will never be used by the U.S. to improve its offensive capability or to launch a first strike." Gorbachev seems to be so focused on the issue of strategic defenses that he is not willing to enage in serious discussion of other issues. In their private meeting the two leaders discussed the idea of a 50 percent reduction in the levels of strategic nuclear weapons. Gorbachev's firm position is that such an agreement cannot be negotiated apart from the issues of strategic defense and that it should be tied to a reconfirmation of the traditional understanding of the 1972 ABM treaty. Reagan does not see the defensive weapons as part of the arms race and therefore does not see the need to include them in the Geneva negotiations. Reagan is surprised that Gorbachev "kept on speaking on space weapons." Gorbachev admits that, on a human level, he could understand that the "idea of strategic defense had captivated the President's imagination." In this conversation both sides come close to learning the key concern of the other-Reagan's sincere belief that a strategic defense system could prevent nuclear war, and Gorbachev's abhorrence of putting weapons in space. During the dinner Gorbachev used a quote from the Bible that there was a time to throw stones and a time to gather stones which have been cast in the past to indicate that now the President and he should move to resolve their practical disagreements in the last day of meetings remaining. In his response, Reagan stated that "if the people of the world were to find out that there was some alien life form that was going to attack the Earth aproaching on Halley's Comet, then that knowledge would unite all peoples of the world." At this meeting Reagan presented a detailed U.S. program on strategic arms reductions and a notion of an interim INF agreement. Gorbachev agreed to the idea of reductions, but emphasized that the Soviet Union could not agree to proposals that would jeopardize Soviet security, meaning Reagan's insistence on the SDI. The main focus of Gorbachev's talk was once again on the SDI and on why Reagan should be so focused on it if the other side found it unacceptable. To that, Reagan responded with a proposal that whoever developed a feasible defense system should share it, and that way the threat would be eliminated. Gorbachev gave his agreement to a separate INF agreement and to deep cuts under the condition that the United States would not develop a strategic defense system because that would mean bulding a new class of weapons to be put in space. At this meeting the leaders discussed the possibility of producing a joint statement on the result of the Summit. In contrast to previous U.S.-Soviet summits, no draft of such a statement was prepared before due to U.S. objections to such a draft. At the final dinner both sides emphasized that here at Geneva they started something that would lead them to more significant steps in improving bilateral relations and the global situation, "with mutual understanding and a sense of responsibility." In the conversation after dinner Reagan and Gorbachev discussed the prepared joint statement and their respective statements, which should express their strong support for the ideas expressed in that document. Alexander Yakovlev's notes emphasize the main points of the Geneva discussions, the new elements of U.S.-Soviet dialog. He notes the need of improvement in all aspects of bilateral relations, Gorbachev's statement that the USSR would be satisfied by a lower level of security for the United States, underscoring the need for equal security, and his call for both countries to show good will in bilateral relations. Yakovlev gives particular attention to the discussion of the SDI in his notes, and to the differences in the U.S. and Soviet views on strategic defense. Anatoly Chernyaev as Deputy Head of the International Department of the CC CPSU was involved in drafting Soviet positions for the Geneva Summit. He learned about the results of the summit from Boris Ponomarev. In his diary he noted the cardinal nature of the change-nothing has changed in the military balance, and yet a turning point was noticeable, the leaders came to the understanding that nobody would start a nuclear war. He notes also that although initially Reagan was not responsive to Gorbachev's efforts, in the end the President "did crack open after all." In his post-Geneva speech to the conference of the CC CPSU Gorbachev gives an ambivalent analysis of the summit. Noting that the U.S. main positions have not changed, and that Reagan is "maneuvering," he also emphasized the fact that the administration could not but respond to public pressure and start making steps forward in the direction of Soviet proposals. Generally, Gorbachev's remarks here are very cautious, because he is speaking to a wider audience than the Politburo, and still they are less ideological than might be expected in his analysis of U.S.-Soviet relations. He also touches upon the need to keep up defenses and the importance, indeed the "sacred" character, of the defense industry. In this first post-Geneva letter to the U.S. President, Gorbachev is calling for building on the spirit of Geneva with concrete actions. The Soviet leader talks about the need to stop all nuclear testing, and invites the United States to join the Soviet moratorium, which was due to expire in January 1986. As a new step, he proposes a system of international control and inspections, which in a significant break with the past would allow U.S. observers to inspect locations of "questionable" activities on a mutual basis. The tone of the letter is completely non-ideological and provides an interesting contrast with Gorbachev's report on the summit to the Central Committee conference. In this letter to Gorbachev Reagan is trying to build on the spirit of Geneva, underscoring the new understanding that the two leaders found during the discussions. Importantly, Reagan notes two main differences, which left a profound impression on his thinking. First, that he was "struck by [Gorbachev's] conviction that ... [the SDI] is somehow designed to secure a strategic advantage-even to permit a first strike capability." He tries to assuage that concern. The second issue raised in the letter is the issue of regional conflict, where the U.S. President suggests that a significant step in improving U.S.-Soviet relations would be a Soviet decision to "withdraw your forces from Afghanistan." He suggests that the two leaders should set themselves a private goal-to find a practical way to solve the two issues he had mentioned in the letter. In this memorandum to Gorbachev, Yakovlev outlines his view of the much-needed transformation of the political system of the Soviet Union. Yakovlev writes in his memoir that he prepared this document in several drafts earlier in the year but hesitated to present it to Gorbachev because he believed his own official standing at the time was still too junior. Yakovlev's approach here is thoroughly based on a perceived need for democratization, starting with intra-party democratization. The memo suggests introducing several truly ground-breaking reforms, including genuine multi-candidate elections, free discussion of political positions, a division of power between the legislative and executive branches, independence of the judicial branch, and real guarantees of human rights and freedoms. 1. Jack F. Matlock, Jr. Reagan and Gorbachev : How the Cold War Ended (New York : Random House, 2004), p. 168. 2. Anatoly Dobrynin, In Confidence: Moscow's Ambassador to America's Six Cold War Presidents (1962-1986). (New York: Random House, 1995), p. 591.